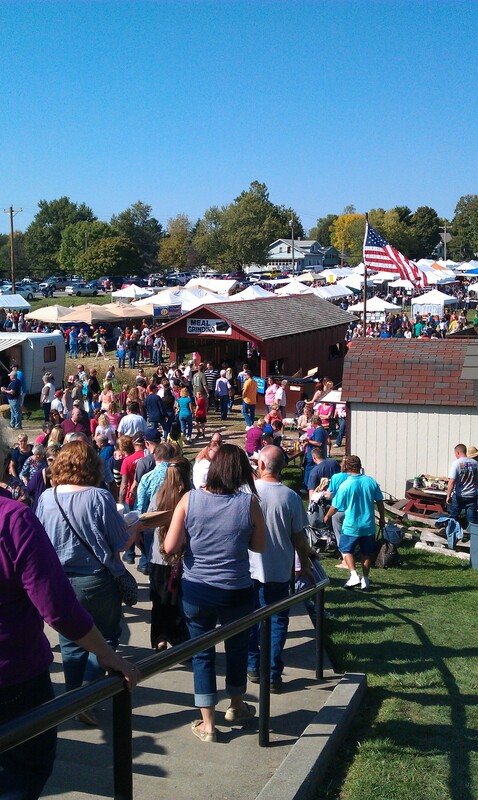 I went to the 44th annual Apple and Pork Festival on Saturday. I went alone and when I go to the Festival alone, it’s a very business-like trip. I don’t bother looking around much. I walk uptown to the Square, take the tram to the Homestead, follow the flow through the covered bridge to the flea market, head to the last row and walk up to the last stall on the left, buy a ring from the same lady that’s always there, walk back through the gauntlet of browsers and strollers and people that think stopping in the middle of the flow to chat or gawk is acceptable, back through the covered bridge, up to the place that sells ham sandwiches so I can get an apple doughnut, then off the grounds and across the street to grab a lemon shake-up before I catch the tram back to the Square and walk home. Now, if go with someone, there’s a lot more walking. Walking from the house to the Square. From the Square to the Save-A-Lot parking lot and the old Junior High grounds. From there to the Homestead (five or six blocks), checking out the booths set up in yards along the way. Then at the grounds, the flea market is taken row by row and all of the buildings gone through. The we walk home on the opposite side of the street to catch all of the booths we missed on the walk up. But when I go alone, it’s all business. I think it’s because I don’t like to dwell around up there when I’m alone. Because I’m not really alone. I’ve got a lot of memories there. My grandma loved going to the Apple and Pork Festival. It was a thing every year. Before there was a tram, before there was a bus, my grandparents would drive up to our house and then we’d walk up to the festival together. Back then there wasn’t much on the Square. It didn’t really start until the Junior High (which still existed). Sometimes Mom would go with us, sometimes Aunt Jo would be in town. Sometimes it was just my grandparents and my sister and me. Dad was almost always working the event. We’d walk up together and the walk would take forever. When you’re a kind those kinds of walks were long anyway, but the constant stopping because Grandma wanted to look at something made it longer. Same with the flea market and such at the Homestead. When you’re a kid, these things hardly hold much in the way of appeal. We’d get our face painted and look at shiny things, but to us the Apple and Pork was boring because there were no rides like the county fair. Papa was usually good for one toy if we were good. Foam lizards on leashes were always popular when I was a kid, but I remember one year I got a blow up crayon and another a blow up shark. I can remember being so tired by the end of the Homestead walk around that walking home was utter torture. I think about those things every year that I go. And every year I go, as I’m getting ready to make my walk up to the Square, alone or not, I feel like I’m waiting on my grandma. I keep expecting the car to pull in the driveway and Grandma and Papa to walk in the house, both of them wearing their good clothes, Grandma decorated with her jewelry (most of which was bought at flea markets and auctions), her glasses perched on top of her head. I expect to be kept waiting ten or fifteen minutes during the small talk before we start our walk up there. My grandma has been dead for eight years now. It was probably several years before she died that I last went to an Apple and Pork with her and Papa (once I started working, I rarely got a weekend off to go). It’s a silly thing to expect that after all of these years, but I do. I guess it’s just an ingrained expectation, like the ring and the apple doughnut and the lemon shake-up. Going with Grandma and Papa is all part of the Festival for me, even if they’re both gone now. So, when I go alone, it’s all business. Grandma’s not around anymore. I don’t feel like looking.